Edward James Olmos (Axford) has achieved extraordinary success as an actor, producer, and humanitarian. The Tony, Emmy and Academy Award® Nominated actor, is probably best known to young audiences for his work on the SYFY television series Battlestar Galatica as Admiral William Adama. Although the series kept the actor busy during its run from 2003 through 2009, it didn’t stop him from directing the HBO movie Walkout in 2007, for which he earned a DGA Nomination in the Outstanding Directorial Achievement in Movies for Television category. Olmos’ career in entertainment spans over 30 years. In that time he created a signature style and aesthetic that he applies to every artist endeavor, often grounding his characters in reality and gravitas. His dedication to his craft has brought him attention across the industry, and with audiences worldwide. Other credits as an actor include the motion pictures My Family/Mi Familia; Selena, which was a breakout film for Jennifer Lopez; and In the Time of Butterflies, in which he played Dominican Republic dictator Rafael Leonidas Trujillo. In television, he enjoyed a recurring role as U.S. Supreme Court Justice Roberto Mendoza in the NBC drama The West Wing, portrayed a widowed father in the PBS drama American Family: Journey of Dreams, and recently Directed the YouTube phenomena The Short Film BP Doesn’t Want You To See, featured on Larry King/CNN. 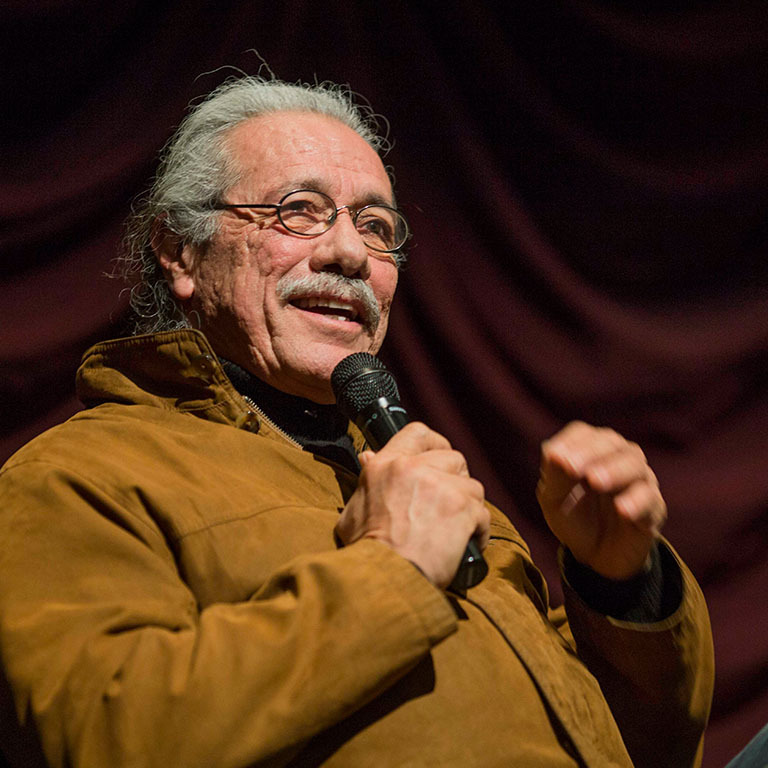 Edward James Olmos on stage at the IU Cinema.